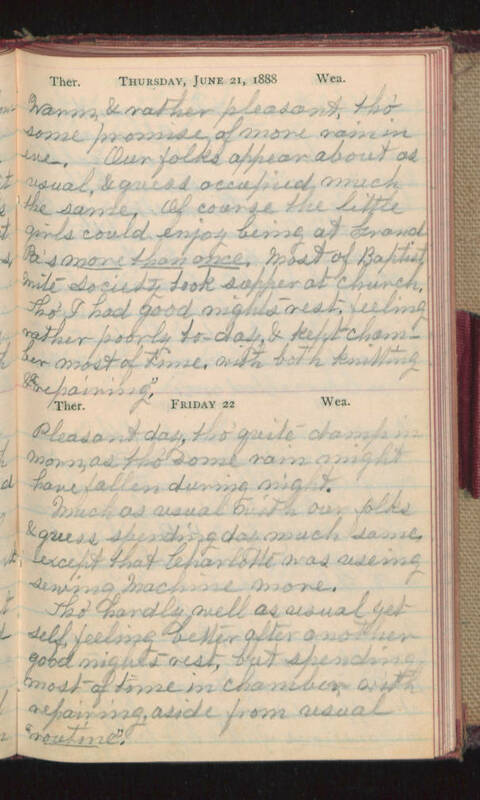 Thursday, June 21, 1888 Warm, & rather pleasant, tho' some promise of more rain in eve. Our folks appear about as usual, & guess occupied much the same. Of course the little girls could enjoy being at Grandpa's more than once. Most of Baptist nite society took supper at church. Tho' I had good nights rest, feeling rather poorly to-day, & kept chamber most of time, with both knitting & "repairing". Friday 22 Pleasant day, tho' quite damp in morn, as tho' some rain might have fallen during night. Much as usual with our folks & guess spending day much same except that Charlotte was using sewing machine more. Tho' hardly well as usual yet self, feeling better after another good nights rest, but spending most of time in chamber with repairing, aside from usual "routine".